This tut was written Nov 28, 2016 for those with a basic knowledge of psp. The tube is called Winter Activities. Resize paper 5 to 23%, paste, apply your mask, delete and merge group, duplicate, merge down, resize larger to 110%. Resize element 104 to 60%, paste on the mask layer. Resize element 115 to 35%, paste on the right, duplicate move to the left and down some. Resize your tube to 50%, paste off to the left side more. Resize the overlay 7 to 35%, paste under your tube, duplicate, move above your tube and erase the parts you do not want on top of the tube. Resize element 113 to 15%, place below the ski's layer to the left. Resize element 25 to 30%, place behind the tube where you like, change the blend mode to hard light, duplicate, resize to 85%, move over to the right more, duplicate, mirror, adjust. Resize element 12 to 20%, place on the right side how you like. Resize element 16 to 20%, place below the ski layers and down, duplicate, mirror and adjust. Do not merge your tag yet if you are going to do the signature tag. For the Signature, new image 600 x 250, fill with either white or a light gray. Paste the mask from your tag, move to one side, duplicate, mirror. Paste the snowflake layer from your tag. Copy and paste one of the trees, duplicate a couple of times and place where you like. Paste the reindeer, resize smaller and place on the right. Paste your tube, mirror, change the blend mode to overlay and move to the right. Paste your tube again, move to the left. Resize the skis, place toward the right and more at the bottom, below your tube layer. Once happy with it all, merge visible, add copyright and name. 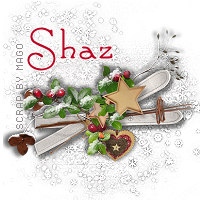 If you want to do the Avator like I have, resize the ski cluster to a size to fit what is allowed for your group, then resize the snowflakes and place behind the skis, sharpen and add you name or an initial. If you would like a frame then do like before. Now Crop your tag to be sure no stray shadows are on the edges of your tag.